Seven small oak barrels marked the beginning a family tradition of dedication to the preparation of the exquisite wine of the region of Montes de Málaga from sun-dried grapes grown in this area. Juan Muñoz Navarrete was the founder of the winery, a business that was already consolidated by the twenties of last century. Until the sixties, Juan would work without rest and only applied artisanal techniques, taking care of every single detail of the job and passing the secrets of the wine-making process to his son Antonio Muñoz Cabrera, the current owner of the winery. By the end of the seventies he started an innovation phase: the first motor-driven tools entered, and with them modern bottling processes for the various types of wine. At the same time had come up the wish and the first programs to enter the foreign market and launch the products abroad. That is how the already excellent quality of our wines was even improved. The company management was also very pleased with two other major events in its history. In 1997 the company Distribuidora Moclinejense de Bebidas Dimobe was established, to offer the most distinguished and exclusive service to our customers. The steady effort and determination of Antonio Muñoz and his children resulted in the opening of a Museo de la Bodega, where all kind of historic evidence is kept to illustrate the company’s trajectory: hand-driven machinery, artisanal tools and old clay deposits are some of the objects that the visitors to the museum highly value. 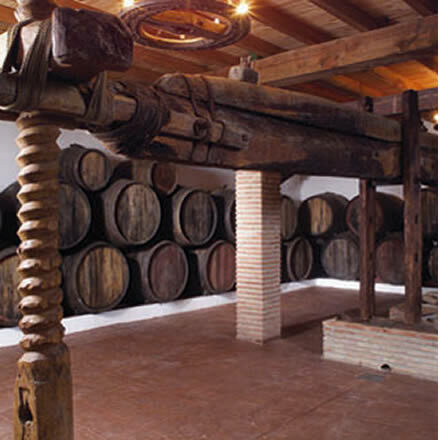 Characterized by the combination of traditional wine preparation in the past and modern entrepreneurship in the present, decisive moments and issues have turned the Bodega Antonio Muñoz Cabrera into a unique reference for the muscatel wine-production in the Montes de Málaga.